You guys, I am so busy. I wake up super early and most mornings, all I have time for is brush my teeth, wash my face and hands, use the restroom, get dressed and repeat the same process for Vivian as I get her ready for school. I don't even drink coffee or have anything to eat which is bad because I won't eat before 3 or 4, later that way. The worst part of it all, is that it looks like the middle of the night, outside. The night-time looking early morning makes it hard for Viv to wake up too. 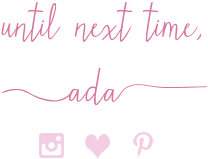 Many mornings like Friday and today (Monday) I haven't had time to linkup my posts either or do a little bit of blog reading and commenting in the morning and that has affected my post views and commenting on the blog, if I am being honest. But it is OK because this is still very much a hobby and a very time-consuming, at times exhausting too. But I have worn at least one piece a day from the 5 pieces I selected to wear for The Common Threads. This outfit is actually from Friday and once again I wore my Khaki Skirt from LOFT, which if you remember from exactly a week ago, I styled it with my Red Striped Nautical Tee (also from Loft) and so far that was my number 1, most favorite outfit from this challenge, this October. Well, scratch that, THE OUTFIT I have on today is so far MY MOST FAVORITE LOOK from this month! I mean, look at how amazing that Sleeveless Ivory-Grey Cardigan is. Loft calls it a coatigan and I couldn't agree more! My beautiful sleeveless long cardigan vest is otherwise called a Sleeveless Coatigan and I purchased it about 3-4 weeks ago (first time wearing it though because it has been such a warm October). LOFT still has it and it comes in 4 colors. Mine is the Toasted Oatmeal which I'd describe between an ivory and a soft dove grey - perfect neutral for cold months. This coatigan is so warm, super soft, extremely cozy and the fact that it doesn't have sleeves, makes it much easier to wear when temps are between 40 and 65. The day I paired it with my Lavender Plaid Blouse and Khaki Cargo Skirt, was pretty warm outside, but I was in and out of the car that day with Vivian and many places are air-conditioned. Loft extended their big 50% OFF Friends+Family sale until the end of the day Monday (October 23rd). If you can buy just one thing from Loft now, invest in this beautiful coatigan. It is actually worth the full price. I am dying to add the Rioja (burgundy) to my closet, too. This dusty lavender, grey and mauve plaid tunic from Old Navy is about 1.5 years old and I have worn it but not on the blog. The colors are perfect for now. The material is the softest rayon blend - it feels silky. 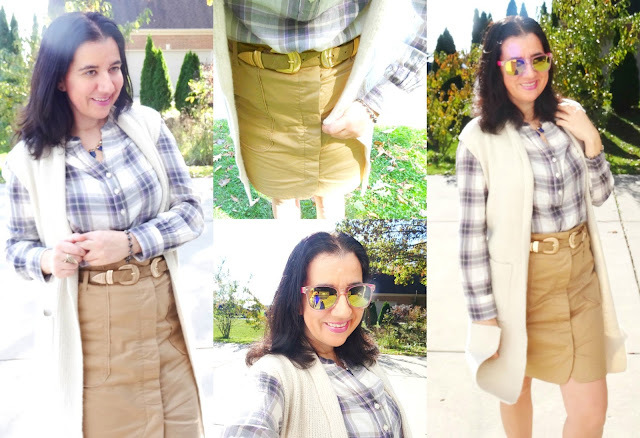 I loved how seamlessly this worked with my camel skirt and oatmeal long sweater vest. Identical Sleeveless Coatigan // Similar Lavender+Grey Plaid Shirt // Identical Khaki Utility, Cargo Skirt // Very Similar Tan Double Buckle Belt // Similar Blue Stone Statement Necklace // Similar, Gorgeous Pink Canvas Keds (Sneakers) // Similar Silver Spiky Bracelet // Similar Gold-Tone Pave Snake Ring // Similar Hot Pink Mirror Wayfarer Sunglasses // Identical Plum Soft Lipstick in "Mauved"
I don't know when these double buckle belts first came into fashion (almost 2 years ago) but I have had mine since Summer of 2016 and the brand B-Low The Belt came out with them first and they have the in many colors. I love the light tan color of mine. It is a dupe from the boutique Pitaya but here is the original identical belt. What a great statement this belt makes. You may have also noticed my Blue Stone Statement Necklace from Loft. Usually I buy dainty or long necklaces at Loft. This was very different and unique. I loved the color, how the stones felt and their shape. Since my outfit is almost monochrome and neutral, this little dark blue necklace definitely popped! I have been meaning to add some pink to my outfits this month. Mostly I have gone for subtle pink since pink is not my most popular color that I wear. I have had my Pink Sneakers - they are Keds - for years but only worn them a couple of times. They are a very light baby pink and currently Keds has some very similar light pink ones without laces (the pink is a little darker and slightly coral) and also these in the same color as mine and very similar style but with a thicker sole like a flatform. I love the stripe across the sole. In general Keds are such classic, cute and very preppy sneakers. They are super comfortable and the type of sneakers you can style with anything from denim to dresses, rompers, shorts and even slacks. But besides my blue necklace, another bright color pop comes from my Neon Sunglasses with iridescent mirror glasses. These glasses have a classic wayfarer style and I have purchased them in Albania a few years ago, when I used to live there. Like I mentioned I have been swamped. Work is as busy as usual but my schedule changed when Vivian started school and by the time we get home, around 5.00, after we eat dinner it gets dark too soon. Photos and outfit shoots have become harder each day. 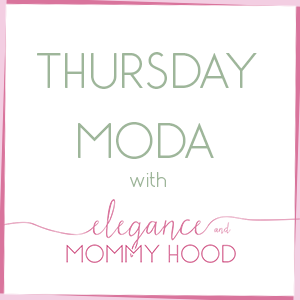 And I have been lacking on Mommy+Mini style posts. So I planned on posting an outfit on Tuesday and two on Wednesday (from The Common Threads Challenge) but I failed. That is why I am posting the Common Threads Linkup code at the end of this post, instead. The last Common Threads linkup will be next Wednesday morning on November 1st and I hope by next Thursday I will have posted the rest and the last of my October Outfits from this challenge. Meanwhile join the linkup below and go follow some stylish ladies - some of which are doing the common threads challenge with me, as the graphic below, shows.